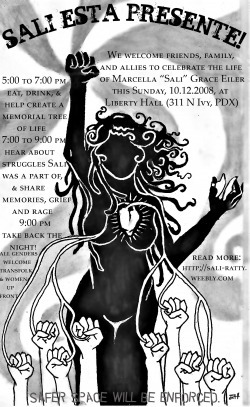 A memorial will be held for Sali on Saturday, March 21, 2009, from 2-5 PM at New Zone Gallery, 164 West Broadway, Eugene, Oregon. Sali was born in Kirkland, Washington on September 30, 1987 and moved to Eugene at age 6. Her early childhood was peaceful and sweet. She enjoyed sports, friends, family and school. Sali developed an early appreciation of the inequity and injustice in life and stepped directly from child to activist. Sali attended Spencer Butte Middle School, South Eugene High School and Wellsprings Friends School. While a student, Sali taught English to Central American torture survivors, championed animal rights and worked to save old growth forests. Sali earned her GED at 16 and accelerated. She worked with "Food Not Bombs" using her skills to turn reclaimed dumpster food into hot meals. She contributed to grassroots reporting of news, both in Mexico and North America for "Indymedia". Sali provided life saving assistance to Mexican migrants through the humanitarian movement "No More Deaths". Sali lived in Oaxaca, Mexico where she taught and performed dance and worked with a local movement supporting indigenous peoples' rights to self sufficiency. Sali was a banjo player, an artist and sang with a Mexican punk rock band -- a laughing, singing, dancing firecracker. She was an inspiring humanitarian, a courageous woman of warmth, compassion, beauty and endless energy who believed anything was possible. Sali received a posthumous award for her humanitarian work from the City of Tucson, Arizona, that states in part, "She fought for justice and fairness, regardless of borders, sought equality and prosperity for all, and believed that all people should have the opportunity to realize their hopes and dreams. 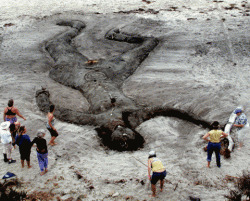 Sali was murdered in San Jose del Pacifico, Oaxaca, Mexico on September 15, 2008. Sali is a loved and cherished daughter to Barbara Healy and John Eiler, stepdaughter to Catherine Eiler, sister to Claire Eiler, Cavan Telford, Erin Telford, and granddaughter to Arthur Healy. update* we are meeting at zaus at 1pm to carpool and 2 pm at the campfire spot or at wilder house if its raining.